I’ve already said why I’m supporting Tim Farron as next Lib Dem leader. 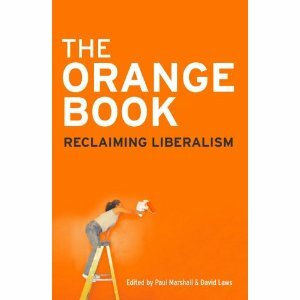 This is a brief coda addressed specifically to those party members, like me, who are quite happy still to be regarded by the divisive label “Orange Bookers” — which I’ve previously defined as being “at ease with the role of a competitive market and who believes also in social justice”. So the small policy differences between them will likely become smaller still whichever is elected. Especially as the loser will, I assume, be given a plum role by the winner — for example, shadow chancellor and/or heading up the party manifesto-writing group. In that situation, then, I think the ability to be a distinctive, passionate campaigner ranks higher up my priority list of what I want from the next leader. That’s the basis on which I, as an “Orange Booker”, will be supporting Tim, while fully recognising that he’s further to the “left” than I am — and that there will almost certainly be times when we’re on opposite sides in specific policy debates. Not sure I can agree. Orange Bookers should hold their nerve and stick with Lamb. I thought it was interesting that on LBC yesterday Clegg said most Lib Dem votes had gone to the Tories because of SNP/Labour fear. His analysis seems to be that Lib Dems need to win back Tory votes, not Labour. A Tim Farron-led shift to the centre-left now could alienate those potential Tory votes in the south west. And it could do so without winning back lefties who still feel betrayed at Tory coalition. If it does then where are the new seats coming from? Scotland? There are no easy answers but to start making another fairly large ideological shift now would only feed into the “they’ll say anything to get elected” feeling about the Lib Dems. I’m not an Orange Booker. But here’s an idea for free that could make the LibDems very distinctive in the education arena. Make education about attainment, not age. It may or may not be useful to know that at age X, Y% of students were failing core subjects like maths and english. However, what would be useful for our economy is if instead of giving them a D or and F and shoving them out into the world of work, we investigated ways to solve the problem. Our economy needs educated people, not people failed by the education system. This is all the more the case when you look at results by month of birth. September starts create a structural problem. It’s time we addressed it.